Read articles about how different sections of the league work. Checkout the leagues general rules. Find out about the league scheme rules. In what season are we? How many days have left? How many games have been played? View the latest games played. Checkout the league standing. Who is leading? Current playoffs. You can checkout the playoffs games and how it all went. List of playoff winners, runner-ups of all finished seasons. This standing is based on single leagues. It shows the activity of clans, communities or countries. How players from each group played on single leagues. Shows game awards, nominations... These awards are chosen by the members. Had a bad start? You can reset! First find someone to play with! People normally ask like 'TUS anyone?' or 'TUS default anyone?' in worms channels, mostly in #AnythingGoes. Tell your opponent what league you want to play. Both players pick one scheme. For example: Player 1 picks WxW and player 2 picks Team17. Players can pick the same scheme. The winner of each scheme comes to the site and reports the game. For example, if your game result was 1:1, Then you must report the scheme you won. Allround league includes Default & Rope ladders. When you play Intermediate, you gain points for both Allround and Default leagues. And when you play Big RR, you gain points for both Allround and Rope leagues. The leagues have both season and overall standings. Each season is followed by playoffs. You can find season info HERE. 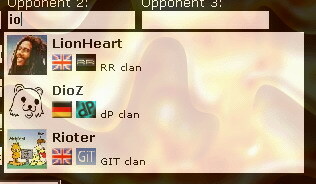 Goto the Leagues page, and click on "Report a game" on your action panel. OR you can goto your user panel. I have put a direct report link on your user panel. Always select the options from top to bottom, Because by selecting some options, Other elements on the page may change. If your game was a clanner select it in the game style select box. Was it single or Clanner? Type in your buddies (If any) and opponents. Don't know his name correct spell? no problem at all! Just type a part(even 1 character) of his name, no matter where that part is in his/her name. If you have set the game style to clanner, Another field will appear to help you find your buddies and opponents easier. In this field, Select your opponent clan. When selecting them, Then buddies field and opponents field will change accordingly. For example If you selected your opponents clan, The buddies field will show you only your own clan members and opponents field will show only the opponents clan members. Select the scheme that you won. *Each player(Team) reports the scheme they have won. There's 'Free Win' checkbox, if you check this option, You are asking for a free win and you won't need to upload the game replay. We allow free wins in special circumstances. So you better have a good explanation why you are reporting this free win. If you dont' check the checkbox, Then it is a normal win and you have to upload your game replay. Choose your game replay from your hard drive. Why there are more than 1 place for replay uploading? If you agreed with your opponent that you play a bo3 game OR somehow you finished your game in 2 or more replays. (Someone crashed or something). The last option is "More games to report". If you select yes, The report page won't redirect you to the recent games, Instead you will be redirect again to the report page which you can report other games. If you select no, You will be redirected to the recent games page to see your games. Click on Report and you are done! 1vs1, 2vs2, 3vs3 single games. Points calculation system changed based on ELO formula tuned for TUS. Points calculation system is now points-base instead of rate-base. But system will just use ranks to "label" your points. Each 60 points are one rank. Starting from 1000 (Absolute Beginner) up to 2200 or more (Elite). The max points someone can gain is 80. Beating a lower skilled player will cause gaining less points than what it was before. So hopefully less noobbashing this time. Leagues Analyzer is originally suggested by pr. It is very similar to the report page, just choose your opponent and the way your game will be and click on the analyze button. The yellow numbers are the points being gained or lost. The left number next to a yellow number is the points before that game (Current points). the right number is the final points after the game. Spamming is disallowed in the games and also on our site. You may not fluster your opponent by writing pointless materials constantly. Insulting other players, people is always disallowed in games and also on our site. As there might be some players under the age of 18, no sexual content may be uploaded or shown on the site. No racial or any other discrimination is allowed on our site or in the games. Any behavious like that will be highly penalized. Cheating by any program is highly forbidden. Anyone caught on cheating may be banned for the whole season (at the moderators discretion). Noone may use alias and ask for league games under alias or claim one's Cup or Tourney game under alias. Getting caught with aliasing results banning (at the moderators discretion). Registering double accounts is forbidden, results banning. No graves or teamnames may be used that might confuse the opponent. You can play the same opponent 15 times in the same season in the same league. Report page will give you an error if you try to report more games. You must use the official schemes found on the schemes page. If you host and use the incorrect scheme without telling them, your opponent has the right to replay the game with the correct scheme. If one player lags out and returns to the given channel, the game should be continued with handicap or restarted. If a game is lagging, do not quit. Quitting means you surrender. If a game lags out, let it lag out. If it was the first game, then the game should not be reported, rather played at another time. If it was the second game and the loser of the first game was seemingly losing the second game too, it can be reported. At any other occasion the moderators will decide about the outcome of the game, after it is posted to the forum's League Complaints section. Moderators will never decide about the outcome of a game considering the skills of the players. Always the state of the game is what the moderators consider. Quitting a game before it ends means you forfeit the game. There is only one exception to the rule: if your opponent chose the wrong scheme without informing you. Before you quit, you must point out the scheme is incorrect and that you want to replay the game with the correct scheme. If a player returns to the channel but does not want to continue the game, then the quitting player's opponent automatically wins. Only acceptable way of quitting is if the quitting is reasonable and the quitting player agrees with his/her opponent on playing the game another time. Mostly the moderators will consider the state of the game, the way of the quitting, how the conversation went on and also the number of the game (first or second) and then decide about the outcome of the game(s). Lag-outs and Quittings that could not be solved between the two players must be posted to League Complaints. Intentional Lag-outs, quittings or surrendering in 2vs2 or 3vs3 games (both singles and clanners), in a way that benefits the quitting team are not allowed. In such cases, under the moderators discretion the game will be rematched or a win will be given to the opposite team. First, you need to find a partner. Then you decide which kind of league you want to play: Classic or Free. Both of you have to pick one scheme and play those two games. The higher season rating must pick first. Before the first game start, both of you have to tell what your username on the site is. Missing to do this might have your games infirmed. Both players/clans need to agree on the map. If you light up, you agree on the map. Using auto-light up is strictly forbidden. If the opponent picks a non-default sized map without informing you, you can still request a normal sized map at the start of the game and interrupt the game. If the scheme has manual worm placement, you must make the request before the first turn of the game. If the scheme has random worm placement, you must make the request before the second turn of the game. After you finished the games, and the games result is 1-1, you can agree on playing a third game. EVERY GAME MUST BE REPORTED! This means DoN (Double or Nothing) games are highly forbidden! Winner of a game reports his own game. Losers do not need to confirm anything. The game must be reported within 6 hours after the game was played. Otherwise mods decide to keep the game and correct its order or delete it. Loading up a fake replay is obviously forbidden. Getting caught with this results in banning. Avoiding a player/clan is not allowed. Avoiding is when you look for TUS but refuse to play against a specific opponent and keep looking. If a player is looking for TUS but avoids you, you can post the logs or screenshots to leagues complaint forum and ask for permission to report a free win. If mods agree, you can report a free win and the opponent has one week to play the game. Players must arrange the game in the game/complaint thread. If you want to play only specific schemes, you must make this clear when looking for TUS. For example: "TUS BnG anyone?" or "TUS no Elite anyone?". Openly searching "TUS anyone?" but then refusing to play a specific scheme is considered avoiding. After you have found out the opponent's scheme pick, you must play the game. If a player agrees to play TUS with you and then disappears before asking your scheme pick, you CANNOT report free win. If a player plays your pick, but then disappears at his pick, you CANNOT report free win. If a player plays his pick but then disappears at your pick, you CAN report free win. But even that free win must be played when that player comes back. Playoffs are played between the first eight players of the leagues' total stats, and only those get in who played the required minimum games. Playoffs are basically a smaller tourney and the site generates the pairs automatically. You must play at least 80 games in the season to get in to the Playoffs for classic league. (70 games for clans), 50/20 for TEL and TRL and 30/5 for Free league. Each round of the playoffs stand of 5 different picks. The players pick schemes by turns and the higher ranked player has the advantage of picking first. Deadlines are usually posted on the forums by the moderators, based on activity at the moderators discretion. Any player or clan who fails to finish their playoff games and is kicked out will be disqualified from the next playoffs of that league. After that, they are free to qualify again. Select the season you want, and click on the "Set, GO!". It changes the leagues time to that season in all pages. For example If you set the time machine to season #1 in recent games page, The stats page will show you the season #1 result too, so does every other page. There's another option called "Show me the overall stats". This will show you ALL the seasons together, Without any time limitation. For example if you want to see players stats by every single game they've played, not only by 1 season, OR you want to see a player rank in TUS, Set the Time Machine to this option. I guess this is be the easiest way to find something in previous leagues or maybe to compare same page in different leagues. First I wanted to code some "advanced" search which gives a lot of options. I thought to make 1 field for search and include all the "advanced" things inside it. The search field combine all the words you type together, Tries to find all the words. If you have doubts about your words, you can include !or in your search words, so that the system tries to find games that have at least one of your words. Gives you games with word The AND Ultimate AND Site. 2. Looking for games for specific players? 3. Looking for games for specific players and specific scheme? 4. Looking for games for specific players and specific scheme and specific game style? 5. Looking for games for specific players and specific game type? 6. Looking for games for specific clans? You can combine as many words as you want and the order doesn't matter. There's a game (last one when I'm writing this), KeKkO vs Artharas. Have you had a bad start? You can reset your entire stat, Yaaaaay!!! 2. In the first half of each season. 3. If the stats you want to reset is under 1000. Otherwise you will see the reset button is disabled. If you reset your current season stats, Your games in that season will be reset and you can keep your previous points + a new start in the current season. 1. Your overall stats will be reset, Which means if someone watch your overall stats he/she will see that you have 1000 points. 2. When you report a game, The league system counts your new points and won't look at your history. 3. Your history WON'T be reset. If someone look at your stats in previous seasons he will actually see your stats in that time. Why? If everyone could reset his stats permanently, Then we shouldn't keep any history at all. If you reset your current season stats, You get to reset your entire stats as well anytime in that current season (If we are in the first half of that season). But if you reset your entire stats, The current season button will get disable too. In other words, The reset button for entire stats is like History reset + current season reset.